Sonoran Lifestyle Real Estate is pleased to present the Year-End, 2016 analysis of our Fountain Hills, Arizona real estate market. As a sales team committed to our community, we always look forward to an opportunity to better understand the dynamics of this very vibrant real estate economy. We are proud of our hometown community with its world-class atmosphere and are grateful for the opportunity to help you understand it better. As we begin 2017 with a major transition in our national leadership, Arizona has plenty to be optimistic about. In early January, 2017, Realtor.com placed the Phoenix metro area as the top housing market in the U.S. for 2017. This parallels the Arizona’s spot as one of the hottest new jobs markets in the country, noted by Realtor.com in a separate article. Our Fountain Hills market experienced an extraordinary first half of 2016, cooled somewhat in the second half of the year, and nevertheless ended the year with $342.7 million in residential and homesite sales: 5.2% ahead of 2015 and the highest volume of sales since 2007 a decade ago. 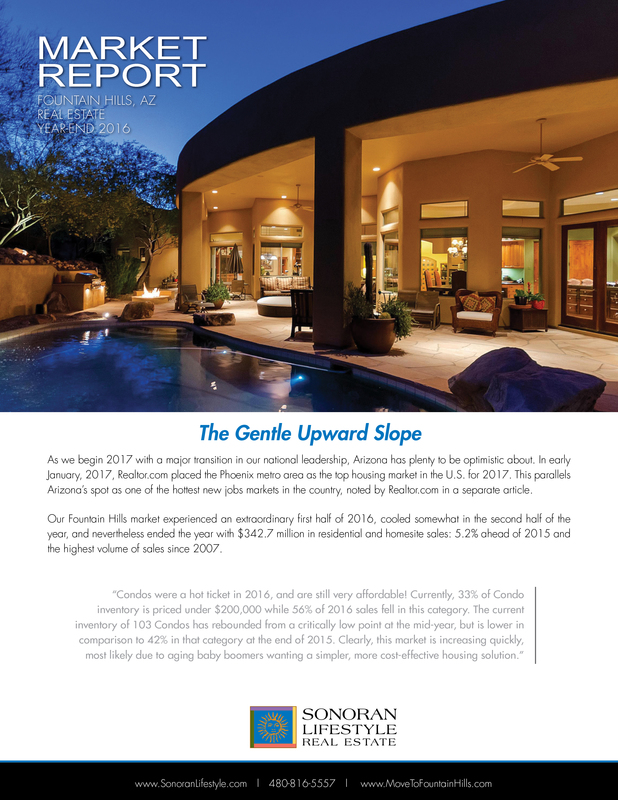 A General Upward Trend: The nice thing about the Fountain Hills real estate market is that it has been a gradual and gentle upward trend since November, 2011. Not too many dramatic increases in values, and not many periods of flat valuation. For all of us who lived through 2008-2011, a balanced, gentle upward trend is much preferable to a steep incline, which is almost always followed by a steep decline. So, if you’re a seller, we hope you’re enjoying our strong market as much as we are. If you’re a buyer: What are you waiting for? Details of the 2016 Analysis can be found at 2016 Year-End Market Report. Want more detail? Contact us at 480-816-5557 for the full 30-page report. We can also create a custom analysis of your home or neighborhood! This entry was posted in Our Real Estate Market and tagged Fountain Hills Market Update. Bookmark the permalink.